Stop repairing polished concrete with polyurea joint fillers. They look like plastic, do not bond well, and do not hold-up over time. Concrete polishing lets the natural beauty of stones, sand, and rock shine through. Your repair product should as well. We took the proven Microdoweling™ properties of Roadware 10 Minute Concrete Mender™ and combined it with natural sands, aggregates and pigments to make repairs that not only look great, but perform better than epoxies and polyureas. Ten things you probably didn’t know about Concrete Mender. A little Concrete Mender goes a long way. A gallon of polyurea or epoxy makes a gallon of repair material. A gallon of Concrete Mender mixed with 2 gallons of manufactured sand makes 2.2 gallons of repair material. That makes polyurea and epoxy more expensive to use even at half the price. 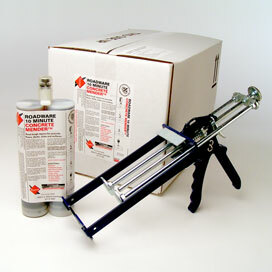 All Roadware 10 Minute Concrete Mender is manufactured and packaged in South St Paul, Minnesota, USA. We do not private label the product to other companies. The, “patent” did not run out allowing other companies to make Concrete Mender. That was a just an amusing rumor we heard at the World of Concrete put out by an unscrupulous exhibitor. Microdoweling is more than a funny word. Microdoweling is the process of using very low surface tension materials that penetrate the surface of damaged concrete and bonding to the aggregate within the concrete mix. It is an exclusive Roadware technology. You can see the scanning electron microscope photos in our website by clicking here. Concrete Mender is a structural repair. Concrete Mender is the flagship product for a new class of materials called structural polyurethanes. It is tough enough to be a structural repair, but never brittle like epoxy. The color of a finished Concrete Mender repair is more influenced by the sand color than anything else. White silica sand will make a light grey repair. Brown sand will make a darker and warmer tone. We do offer Concrete Mender in Grey, Off-white, Safety Yellow, Target Red, Ikea Black and WalMart red/brown. Concrete Mender is sold all over the world and most overseas exported product is shipped via air. When your concrete needs to be fixed in ten minutes, you don’t want to wait eight weeks for ocean freight. When repairing polished concrete floors, you can use polishing dust from the floor, sand and aggregate to give your repairs the same, “texture,” and look of the surrounding concrete. Contractors in New Zealand developed simple techniques to repair hairline cracks in walls damaged by earthquakes near Christchurch. Every cartridge of Roadware 10 Minute Concrete Mender is packaged by hand and inspected by Amanda. 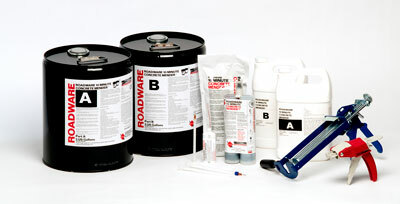 Microdoweling™ and Concrete Mender™ are trademarks of Roadware Incorporated © 2012. Hairline Crack Repair with 10 Minute Concrete Mender™.